When I picked them up Sunday, I was overjoyed to see that they were both stitching perfectly and without complaint. The shop told me that there indeed had been multiple issues and adjustments needed on my old, low-end Kenmore 385.16644 serger (left to me by my wonderful grandmother)... but that my Platimum 730 (bought used from Sew Right nearly 10 years ago) had barely had any needed adjustments. I just could NOT believe this, despite the neat little stitching sample they'd made with a variety of stitch patterns. I told them that one thing I had NEVER been able to get my machine to do was shir with elastic thread in the bobbin (long-time readers may remember my series of agonized blog posts over this before I decided to just do it the really hard and slow way). Hand-winding the elastic thread on the bobbin BACKWARD. Threading the bobbin thread through the tension area WRONG. Once I fixed these two things, I sat down with a light scrap of cotton and some elastic thread and SHIRRED THE EASY WAY. In a STRAIGHT LINE. With NO WOBBLING. I nearly cried in joy (and embarassment). Seriously, it's a wonder that all the garments I've made in the past few years on my machine haven't just fallen apart while I walk around wearing them. (Good thing most of them were serged, actually). I think this is a hazard of taking really long breaks from sewing and then trying to just get back at the machine and pick things up all over again. I've been sewing clothes for myself for over 10 years, but only in sporadic spurts of inspiration — I'll get really intensely into it, pick up some serious skills and practice my finishing and fitting techniques... and then life gets in the way and the sewing machine goes back in the closet for a while. And then I have to relearn anything that hasn't truly stuck all over again. Threading the machine is just easy muscle memory, but somehow along the way I must have forgotten the proper way to load the bobbin (it's a little plastic bobbin, not like the metal ones on most machines that I grew up sewing on). Yeah. 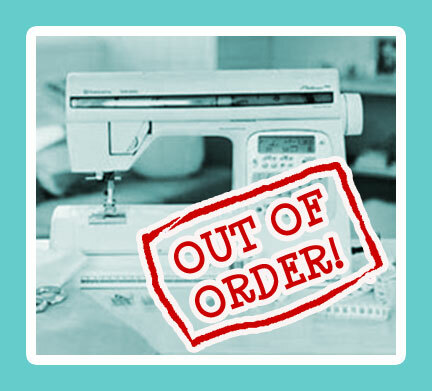 So... what's your most embarrassing sewing foul-up? Harvey and the staff at Sew Right are absolutely fantastic. A serviced machine is a happy machine. Just curious, when you say you were winding the elastic thread on backwards, what do you mean? Yes, Harvey and the rest of the staff are WONDERFUL. To answer your question—so normally when I wind thread on a bobbin, I use the bobbin-winder on the machine. But elastic thread must be hand-wound to keep it from over-stretching. So I was winding it on in the wrong direction—the bobbin has to go into the machine with the little Viking symbol face up, and I wasn't paying attention to that, so I wound it face-down, then put it in face-up, and it wouldn't unwind... does that make any sense? I felt a giant cartoon light bulb exploding over my head at that moment when Harvey showed me it was backwards. Also—I think part of the issue was I was using some generic bobbins that were supposedly Viking-compatible but weren't as high quality. Yes, you are making sense. I always wound elastic thread manually. Isn't it crazy when you do something as simple as putting the bobbin in the wrong way everything gets thrown off? Well, all is well that ends well. You live and you learn. But never feel bad about asking Harvey and his staff about anything as they are always willing to help. I had my serger threaded wrong for YEARS! This stuff happens. When we rehabbed my SIL's machine last fall, it at first wouldn't stitch, then the fee dogs wouldn't move, and then after about 1/2 hr of messing around, it was perfect. Weird! Also, remembering which way a bobbin goes is HARD. I think that I did too! I could never get the tension right on my serger, then when I switched to black thread, the tension was perfect right off the bat. Same when I switch back to white, so I think that I was threading it wrong before then! Usually when my machine isn't making good stitches I've missed a step in threading it, even though it should be second nature how to thread a sewing machine. As an employee of Viking, I urge everyone to make friends with your dealer and definitely to take advantage of the free owners classes. They usually cover things like correct threading, the right bobbins for your machine and how to use the various feet, especially the buttonhole foot. Some dealers have owner's club where you work on a project and learn a new technique. There may be a fee for this, but you have the advantage of having someone there to guide you. I live in NY too, and if I wanted to buy a serger, you would recommend Sew Right, it sounds like? Dealers seem so scarce for such a big city, I just didn't have any idea where to go! Yes, I recommend them whole-heartedly! They have great service and a wide range of sewing machines and sergers from beginner to advanced, AND they often get in used refurbished machines (so I got my machine at half price). Ann, definitely check out Sew Right. They will never sell you anything for the heck of it and are always great. I've been thinking about it and I wonder, if I do decide to buy a serger, if you or anyone else NYC based would be interested in renting a zipcar to go out there at the same time, for one of the classes they offer or whatever? That subway/bus trip is pretty daunting when I look at the map, maybe by car would be easier, and maybe a carpool would make it worth the rental...just an idea! Actually, I did use Zipcar to get to Sew Right this last time... I'd normally lug my machine via subway/bus combo but with two machines I couldn't handle it. 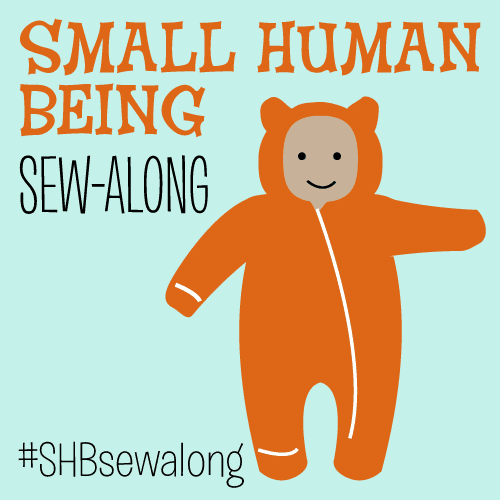 I'm afraid I don't need to head back over there any time soon, but you should totally ask around the sewing blogosphere and see who might be interested. I took a serger class there that was great once. Oh god... everything? Haha seriously, since I'm self-taught, that means I did a LOT of things the ~wrong way~ for years and years. My biggest one was that I always put the bobbin backwards in my Pfaff (in my defense, it was my first front-loading bobbin - I always used top-loading ones before). About a year into owning it, I was discussing it with my mom (who has the same machine) and she pointed out that I was putting it in backwards. She also kept asking me how the heck my seams didn't fall apart! Uhh, I dunno haha! Well, I HAD been pulling my bobbin thread up manually every time... and apparently on my Viking machine you're NOT supposed to... you're just supposed to load the bobbin and pull the thread through the tension disk and then the machine is supposed to pull in the bobbin thread itself. OOPS. Oooh... my most embarrassing mess up/moment of idiocy was setting in cap sleeves upside down, and then when I "fixed" them, setting them into the wrong sides (left on right, right on left). Or maybe it was the time I cut 2 right pants legs but no left leg. Wait, no, it was... I could go on all day... LOL. Honestly, at least you figured it out and now can move forward productively. LMAO Clio ... I have done the sleeve thing but you got me on the 2 right pants leg. Didn't we all have these things when you just started out? Every now and then when I am rushing, I do something really stupid and it reminds me to slow down. I didn't have any major issues with my own machine, but when I was living at my parents' home last summer I was using my mom's machine...I sewed an entire dress with the feed dogs down without even realizing it! I kept wondering why I was doing such a bad job sewing in a straight line. I also sewed almost an entire giant squid with the bobbin thread feeding the wrong direction, and then I wondered why my thread kept breaking. I'm so glad to know other people have similar issues! I do this all the time! Whenever I clean the feed dogs or do free motion quilting, I have to repeat over and over to put the feed dogs back up. And I still inevitably forget and get big thread snarls. Glad your machines are in good working order! Let's see, I've made lots of goofy errors, like putting my invisible zipper foot on backwards the first time, lowering the needle, and immediately snapping it in two. Or there was the time my friend taught me how to knit and I thought I remembered the technique correctly, only I was knitting TBL. This went on for months and I couldn't figure out why my knitting looked so wonky! Me Made Maybe YES 2013!